Welcome to 2016. Just as individuals make new year’s resolutions, organizations tend to assess their priorities when a new year begins. So this may be an excellent time to open discussion on strategic planning for volunteer involvement. During workshops and consultations, I commonly ask a deceptively simple question: What are your goals for volunteer engagement this year? All too often organizations answer with how many they want. In other words, their goal is to have volunteers (and to have more volunteers than last year). But metrics such as head counts, total hours served, demographic diversity, and so on are relatively meaningless without context. So I try a simpler, clearer question: What are your goals for what volunteers will accomplish this year? In other words, what value will they add to your organization and its services? It’s scary how few organizations have articulated a solid response. Or even realize they have neglected to consider purpose and outcomes. Lack of goals means lack of serious expectations for the impact of volunteers. The old adage of “if you don’t have a road map you won’t know where you are going” is very true. There are far-reaching consequences of not having clear goals. Funding for volunteer services is minimal and the volunteer resources manager (VRM) is not valued as strategic to the primary goals of the organization. This leads to giving the VRM additional responsibilities unrelated to volunteer management, bouncing the VRM around from department to department (as there is no rationale for where volunteers “fit” in the organizational structure), and eventually eliminating the position altogether. 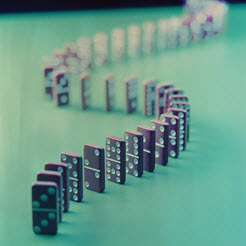 This domino effect is a crash, but it can also become one of those “wow!” moments when hundreds of dominos fall gracefully in exciting patterns. Start with meaningful goals and watch volunteer work be designed in motivating and challenging ways, thereby attracting the sort of potential volunteers who want to accomplish those goals. That evolves into more purposeful teamwork between volunteers and paid staff, all of whom want to assess and measure the outcomes of their work. When senior managers can see the impact of such strategic volunteer involvement, the VRM is invited to organizational planning meetings and funds are found to support volunteers. And, finally, volunteers feel very appreciated because they can see the difference their service makes. Re-visit volunteer involvement goals over time, especially if there have been fundamental changes in your clientele and services or how the organization operates. Are you asking volunteers to do what is needed most, now? Of course it matters what volunteers want to do and to be receptive to activities that they propose, but ultimately the most important factor is the mission of your organization. That means you have the right – actually, the obligation – to direct your energies and resources to achieving what you set out to do. And you should assume that volunteers truly want to support that mission. If volunteer activities are chosen (or retained) mainly to please current volunteers who are no longer the right people for today’s issues, the negative domino effect will activate. Two essential concepts to assure that volunteers stay focused on mission are integration and alignment. No department in an organization can go off on its own to pursue goals they have identified solely for themselves. And since volunteers are assigned to work throughout the organization, the VRM cannot set goals for them independently. All units must articulate goals for volunteers in their service area that are directly connected to the goals they set for their employees. In the same vein, independent or special volunteer projects coordinated specifically by the VRM must also align with the priorities set for all. One test of the value placed on volunteer impact is who participates in creating the strategic plan for their involvement. It should never be the VRM alone. First, the VRM should consult with all managers of the units in which volunteers work to identify current priorities and needs. Then the process should go up the chain of authority to include senior executives. If those at the top do not “own” the stated goals, there is little hope of getting support from them when needed. Besides, strategic planning is about vision. It should matter to everyone that volunteers aspire to the same future everyone else in the organization is working towards. So, what will volunteers accomplish with you this year? Do you feel you have well-articulated goals for volunteer impact? Please share some examples. How have you introduced a more effective strategic planning process for volunteer involvement in your organization? I am always interested in other ideas of improving volunteer responsibilities/activities. This is the one of the greatest articles written. Volunteer Managers want increased status within their agency but do not always want to do the work which is PLANNING. I have been a getting a little reputation by continually asking agencies for a Position Description before I start recruit volunteers. When you look at a list of why volunteers don't stay, many of those reasons could be fixed by better planning. For those that have written a position description...when was the last time you read it? When was the last time you showed it to a potential volunteer? Does the rest of the staff know what is in your position descriptions? Did they help develop them? We are living in the era of volunteer "engagement." Volunteer Managers need to bring on the volunteers with the right skills so that those volunteers feel useful and stay long enough to get "engaged." We have all been to well-planned parties and we have all attended those parties where people just show up. Which ones are we still talking about? Thanks, Carol. Planning -- or rather, strategic planning -- indeed makes all the difference. But we have to engage decision makers and line staff at all times or else we'll forever be seen as off on the sidelines doing something nice but not essential. I received an e-mail the other day from my colleague, Jerry Pannozzo, who asked how we might insert this month’s Hot Topic into the two-day course we co-teach for NYAVA. Your article reinforces points we cover that can’t be stressed enough. It would be an instructive handout for our students. Thank you again for pointing out that an organization that merely pays lip service to wanting to incorporate a meaningful volunteer program is unlikely to be successful. Success follows when organizational management articulates a philosophy and a plan for their volunteer program. It’s one of the fundamentals of developing and maintaining a successful program that is relevant to the organization’s mission. AND it’s one of the first things that Jerry and I stress in teaching NYAVA’s Principles and Practices of Volunteer Management. Until and unless a manager of volunteer resources can engage senior management and the organization as a whole, departmental goals and position descriptions run the risk of looking “made-up” and being irrelevant. Early on in the class, we like to introduce “From the Top Down” as an important addition to every volunteer manager’s library! Thanks so much for your reply, Gloria. The class you and Jerry teach is so important to the NYAVA community!